MB Financial Bank (MB) presented a $25,000 check to South Suburban College (SSC) recently at their Main Campus in South Holland. The donation is a part of MB’s $45,000 commitment to support a renovation of the college’s primary conference room and to establish an endowed scholarship through the SSC Foundation (SSCF). The commitment includes an additional $20,000 endowment over the next four years to permanently establish an MB Financial Bank Scholarship Fund at the college. The donation developed through a long-standing partnership between the South Holland branch and its neighboring community college. The conference room will be called the MB Financial Bank Suite. Located in the most high traffic area of the college near the Atrium and Cafeteria, the space serves as SSC’s most utilized conference room for meetings and workshops. The renovation will include new signage, modern furnishings and the most current presentation and instructional technologies. The room will be renamed with MB Financial Bank Suite signage heading into the spring semester, and SSC plans to complete the project early next year. 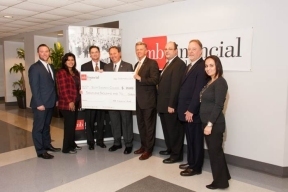 Pictured from left to right: Pat Rush, SSC Foundation Executive Director; Vicky Arroyo, President of MB Community Development Corporation; Vince Laughlin, MB Financial Bank Commercial Group President; Frank Zuccarelli, SSC Chairman of the Board of Trustees; Don De Graff, MB Financial Bank Sr. Vice President & Commercial Division Manager; Timothy Woloszyn, MB Financial Bank Assistant Vice President of Commercial Banking; Don Manning, SSC President; Lesly Flores, MB Financial Bank Community Development Officer.